Editor’s Note: The following article was written by a youth reporter who is a graduate of the Urban Youth International Journalism Program class at People for Community Recovery, a not-for-profit organization based in the Altgeld Gardens public housing development. In April 2011, youths from People for Community Recovery traveled to France as part of a photography exchange program with youths from La Courneuve, a community near Paris. Paris. France. It was something like a dream come true. On Wednesday, April 13, 2011, it was also boring because we arrived too early and had to wait in the small, hot and muggy office of People for Community Recovery filled with over 15 bags and 10 people. After greeting everyone and hugging our family members, our limos arrived. I was filled with mixed emotions. Getting in the limo to the airport I was happy but yet a little sad. I was leaving family and friends. I was thinking of everything that could go wrong as I sat quietly the whole ride. 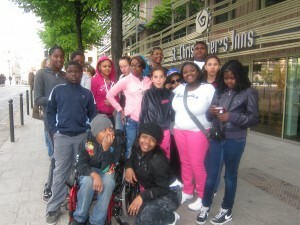 I and the other children and our chaperone and Takia Long took pictures of the whole ride. Students from Altgeld Gardens pose with their French counterparts. I had a chill going through my spine getting out of the car at O’Hare Airport. It was a long, tedious process checking in and going through the security measures, but I was patient. I bought a lot of candy since the security said we couldn’t go through with any food or water because of all the terrorist attempts, but all this really made me feel very safe. We arrived very early so if anything went wrong we would have time to spare. Me, Manquaze (my brother), Lakeshia (a 17-year-old participant in the An Eye for An Eye program) and Hollis (brother of Lakeshia, another participant of An Eye for An Eye) played Uno anxiously waiting to board the plane. Finally about 45 minutes later, we grabbed all of our bags. I couldn’t help but have butterflies in my stomach. We boarded a big white and blue plane with that read “Air France” on the side. The flight attendants greeted us in French, which kind of made me happy, because I knew that I could respond. I put all my bags up in storage. Then, about 15 minutes later, we finally started to move. The best part of the air plane ride was taking off because it was like a roller coaster; I love roller coasters. It was hard trying to force myself to go to sleep knowing I was thousands of feet in the air. The flight was 6 hours. We had made it to the airport around 5 that evening and made it to Paris around 1:30 a.m. I had stayed up during the flight because I was watching movies and talking to the other children in the program. Plus I was too scared I would miss something. Most of the children didn’t go to sleep just as I didn’t. We woke the adult chaperones so we could get off the plane.